As per the airdrop terms, the tokens left in airdrop wallets after Pre & Mega Airdrop allocations will be burned. It is noteworthy that almost 80% (1.6 Million) of reserved tokens for Pre-Airdrop that have not been claimed by airdrop participants, will be burned. The remaining tokens of airdrop wallet will be burned on 08th February 2019, 14:30 UTC. For Mega-Airdrop, 20 Million TDP tokens were reserved for allocation. 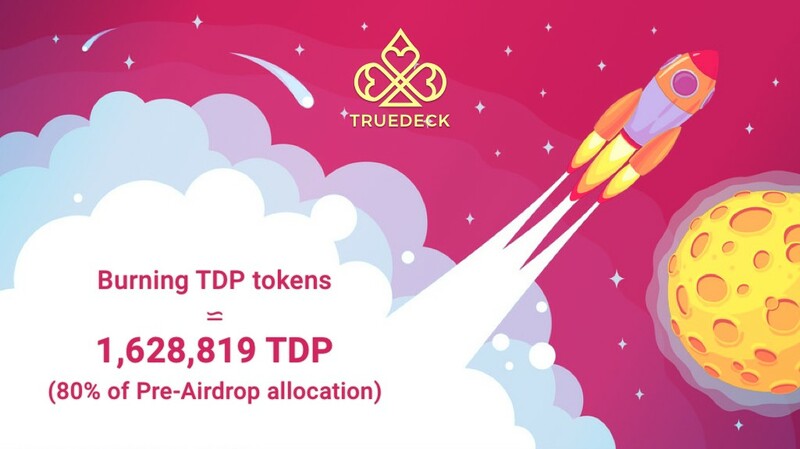 At the time of allocation, we moved 20 Million TDP from our Marketing Wallet to Airdrop Allocation Wallet. Mega-Airdrop allocation data is publicly available on GitHub & Google Sheets. Note: A technical issue occurred during Mega-Airdrop allocation. Due to the technical issue, we had to release additional 300,032.8419 TDP tokens to HitBTC Exchange. Please find the official statement here. Pre-Airdrop allocation data is publicly available on GitHub & Google Sheets. We have made the airdrop allocation data publicly for auditing purposes. Please find the details here.